The time when a youngster’s brain is most open to learning the sounds of a native tongue begins at six months for vowels and at nine months for consonants, according to Scientific American. That means every sound you make is going right into her brain, teaching her which combinations are used for words. The easiest way to provide lots of language input is to simply talk about what you are doing. If you feel silly at first, remember you are chatting with a very important person in your life—she just isn’t holding up her end of the conversation yet. Lullabies are classic for a reason, calming baby with movement and music. You can sing anything as long as you don’t get too crazy on the high notes—radio hits, Christmas tunes, a song about how you are super tired. The point is putting language out in a rhythm. You’ll be surprised which songs your child remembers and requests—I’ve been singing Peter, Paul and Mary’s Leaving on a Jet Plane for ten years and they still haven’t gotten tired of it. If you’re looking for a challenge try these children’s songs in different languages. There’s also some new research out about singing as the best means to calm your baby so you can add language while connecting. 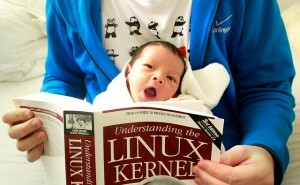 Your baby will start copying your faces and sounds before she hits six months old. Turn the game on its head by copying her babble. She’ll be fascinated and it won’t take long before you’re laughing. Or make animal sounds and wait for your child to copy. Either way you are practicing some of the muscle movements needed to speak. University of Washington researchers studied baby interactions and found that infants absolutely love being imitated. It motivated them to practice new skills, gave them attention from caregivers, and provided powerful incentives to produce language. We love writing about this: Read My Lips: How Babies Learn to Speak by Watching You. Playing with language to make rhymes is a great way that babies and toddlers learn about phonemes, or the sounds that make up words. By changing the end sound, words rhyme. The musicality of nursery rhymes and songs makes them memorable and fun. Speech language pathologists recommend rhyming games as a fun way to build early literacy and the listening skills needed for understanding language. To learn more about how to build language skills in infants, definitely check out Pathways. 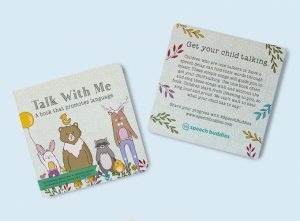 Designed for parents and SLPs concerned with speech delay. This books exposes children to final consonants and encourages first words. Helpful if a child says “bo” instead of “boat” or “uh” instead of “up”. By Cara Tambellini Danielson, M.A. CCC-SLP. 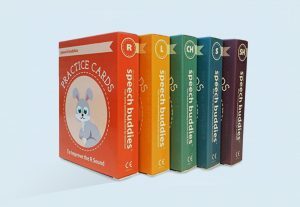 These Flashcard Practice Decks include 5 sets of matching cards with a picture, a word and a sentence. It also includes fun games to play while you practice. Set includes the 5 hardest to say sounds: R, S, SH, L and CH.